This best-selling text uses cognitive psychology research to inform and improve classroom instruction. The new edition is keenly focused on the applications of cognitive psychology specific to education, teaching and learning. The text is accessible and readable; includes a superior, extensive and authoritative section on motivation; and applies the most current research on cognitive psychology and motivation to classroom teaching and student learning. Readers will begin by reading about the basic principles of cognitive psychology, and later move onto the role of beliefs and motivations in cognitive processes and learning. Additionally, readers will explore cognitive and motivational research focused on teaching and learning in specific content areas; the application of psychology to teaching and learning; and the features of cognitive psychology most relevant to education. Furthermore, the text offers superior, extensive and authoritative coverage of motivation not found in comparable texts on the market. 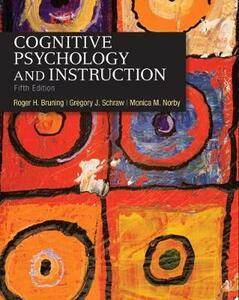 Written for those interested in the applications of psychology to teaching and learning, including pre-service and in-service teachers, as well as other educators, support staff, counselors, and administrators who wish to build a deeper understanding of psychology's applications to education, this text will not disappoint in its goal of teaching how to apply the latest research and theory to practice, as well as instruction how to design educational interventions that engage and motivate all students.